Ms. Mahn’s experience includes four years practicing as an attorney in Los Angeles, where she is a member of the California Bar Association, the American Bar Association, and the American Immigration Lawyers Association. She specializes in immigration and nationality law, business law, corporate transactions, civil litigation, including contract disputes and commercial litigation, and alternative dispute resolution. Additionally Ms. Mahn volunteers with NALEO assisting legal permanent residents with naturalization. Ms. Mahn received her Bachelor’s of Arts in history with a minor in German from the University of Southern California in 2003. While at USC, she was on the Dean’s List for academic excellence. 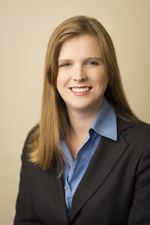 Ms. Mahn received her Juris Doctor from Loyola Law School, Los Angeles in 2009. While at Loyola, she participated on the winning team in Oral Arguments at the Willem C. Vis East Moot Arbitration Competition in Hong Kong and also won Honorary Mention for Best Oralist. Ms. Mahn also attended the 2007 Dublin Institute on International and Comparative Law studying comparative civil rights and international negotiations.